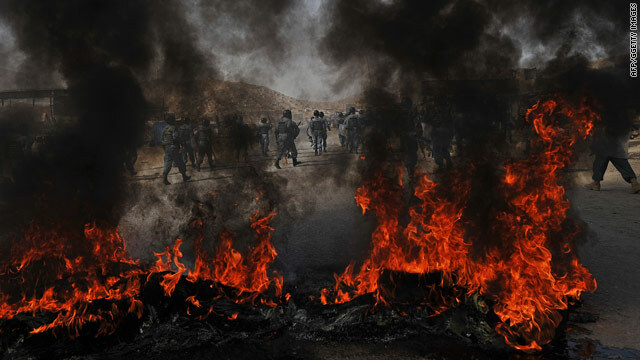 Afghan police run past a fire as they chase anti-US demonstrators during riots in Kabul on September 15, 2010. (CNN) -- An anti-American demonstration in the Afghan capital turned violent Wednesday as five Afghan police officers were injured and two demonstrators were shot by police, officials said. Mohammad Khalil Dastyar, deputy police chief of Kabul, told CNN about 1,200 demonstrators gathered to denounce the United States. He said they chanted "death to America" and condemned the Rev. Terry Jones, the leader of a tiny Florida-based church who ignited an international firestorm when he threatened to set fire to Qurans on the ninth anniversary of the September 11, 2001 terror attacks. Dastyar said five Afghan police officers were wounded when demonstrators began shooting and throwing stones at security forces. Meanwhile, a top hospital official said two protesters were shot in the chest by police. Dr. Kabir Amiri, director of Kabul's network of hospitals, said the demonstrators were being treated for their injuries. Jones, the Florida pastor, ultimately never set fire to Qurans. Nonetheless, Afghanistan has seen several consecutive days of angry -- and sometimes violent -- demonstrations in wake of the Quran-burning controversy.